This is the first cast iron teapot claiming its rightful spot on our top 10 list of best teapots from Adagio. 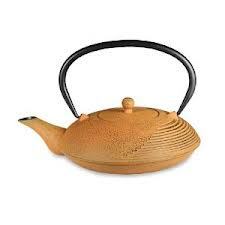 The biggest advantage from this teapot is in the fact that you can keep your brewed tea hot for long periods of time allowing you to fully enjoy your tea ritual. The teapot if fully handmade from molding to painting and finally to glazing that gives it a unique highly detailed aesthetic appeal. The teapot has a stainless steel infuser and can hold 34 Oz. of liquid.